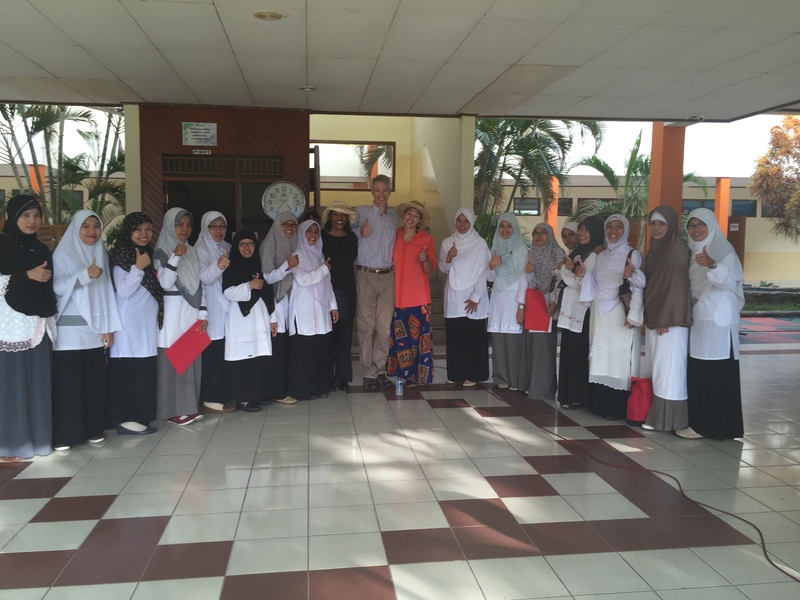 January marked the official halfway point of the 2015-2016 Fulbright ETA grant period in Indonesia. This installment of the Monthly Highlights is courtesy of the ETAs placed in Sulawesi. 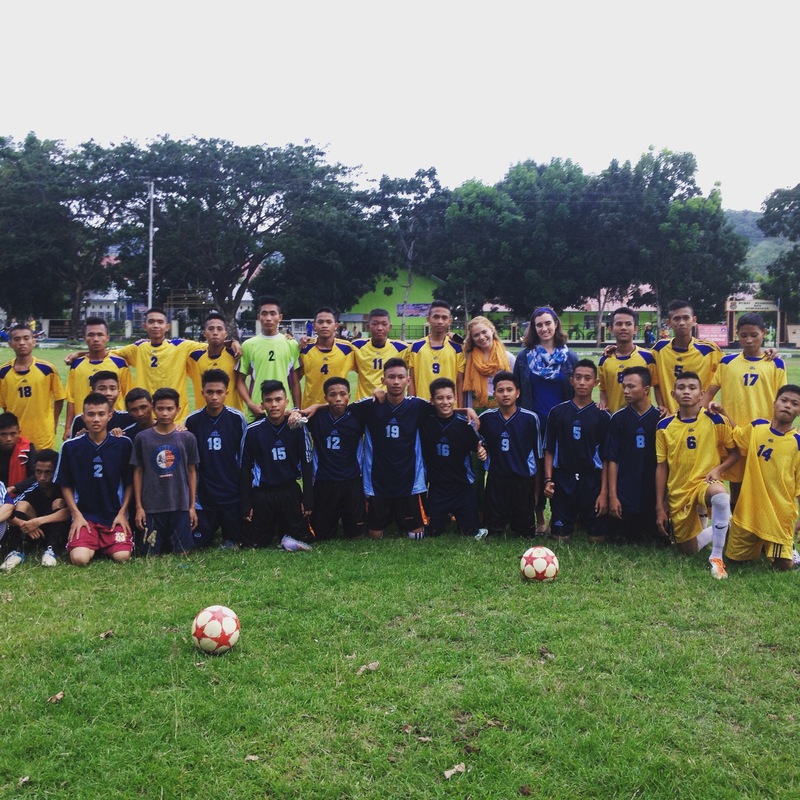 Grace Wivell and Clare McLaughlin attended a football game between their schools, MAN Model Gorontalo and MAN Batudaa, on January 30th. Both teams exhibited great semangat and sportsmanship, and MAN Batudaa handily won the game 3-1. Grace and Clare enjoyed a chance to support their students outside of English activities, as well as the opportunity to attend an after-school activity together. On January 26th through January 28th, Clare McLaughlin joined the spectators as PMR Clubs (similar to First Aid) from local elementary schools, junior high schools, and high schools gathered on MAN Batudaa’s football field for competitions during the day and a community-wide gathering at night. In the photo below, Clare’s buddies from her village’s elementary school lead the parade to the field. 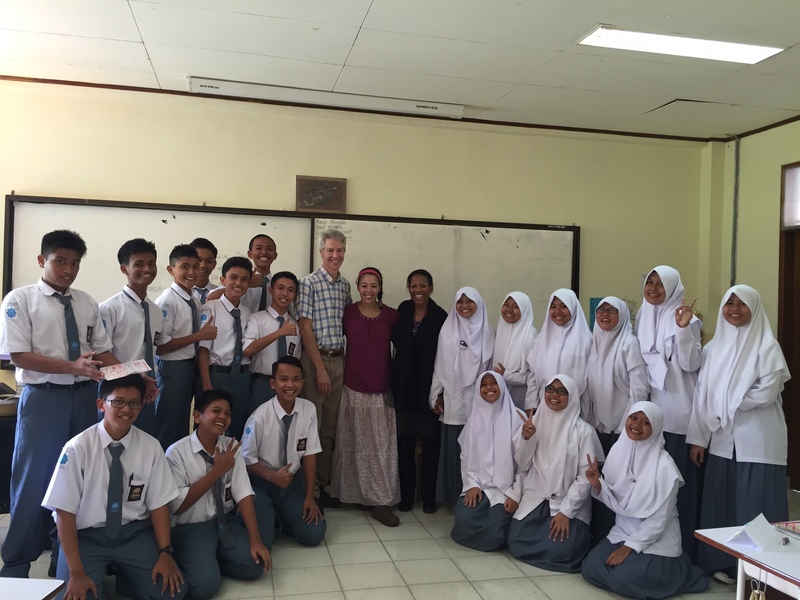 Abby Snyder, an ETA in Mataram, Lombok, partnered with One World Classrooms to foster learning and cross-cultural understanding between classrooms all over the world through the arts and technology. Continuing with the theme of eco-tourism with English Club, each student designed a piece of artwork that depicted the natural beauty of Lombok. Abby then shipped their artwork off to Boston MA, where One World Classrooms collects artwork from around the world. A few weeks later she and her school received a package containing pictures and artwork from every corner of the globe. Abby and her co-teachers are now in the process of organizing a school-wide art exhibition to show-off the artwork and celebrate cross-cultural understanding. They are looking forward to providing students with the opportunity to learn from their international peers. 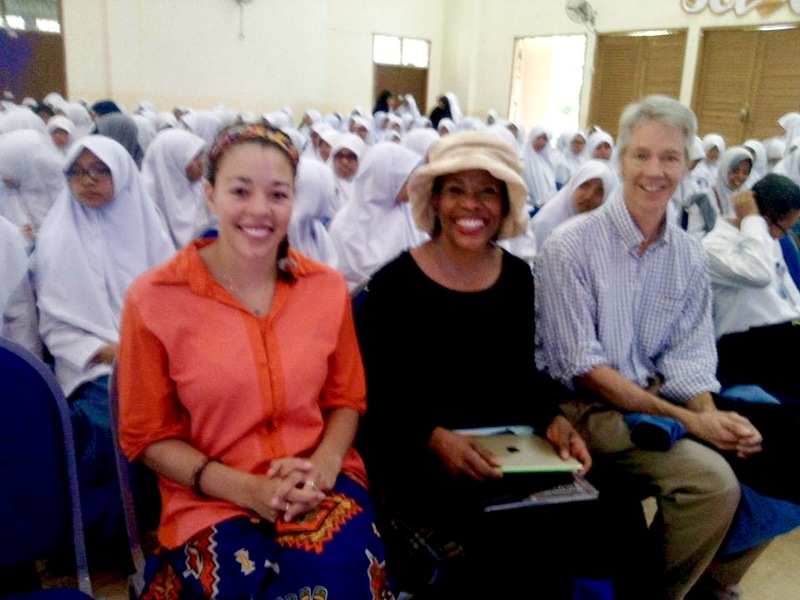 On January 31st, English Teaching Assistants Andrew Baker and Sam Bishop, and English Language Fellow Leah Karels all participated in MAN 2 Model Makassar’s 5th annual English Camp. At the English Camp, they led a session teaching participants American slang, idioms, and English accents. Andrew, Sam, and Leah also answered questions about life as a teenager in the United States and taught an American camp song. Andrew also discussed opportunities to the study in the United States through the YES program. 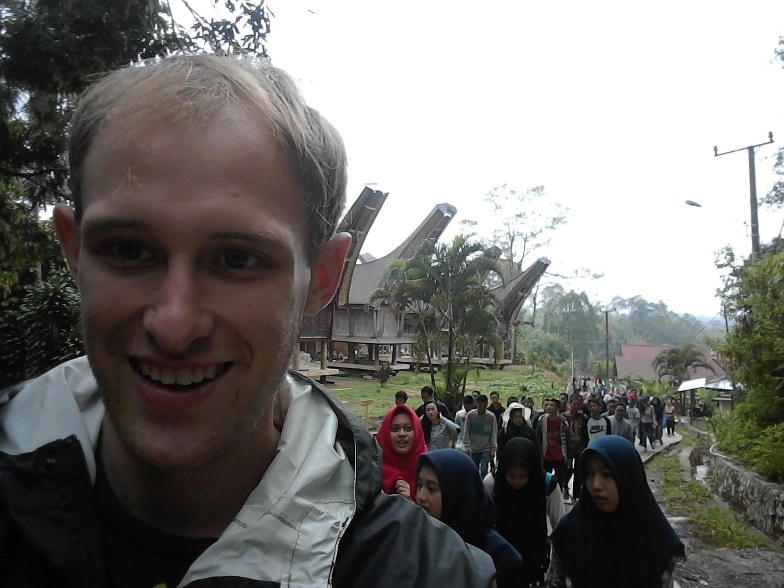 From December 13th to the 15th, 2015, Andrew Baker traveled to Tana Toraja with students from MAN 2 Model Makassar. While in Tana Toraja, he visited famous tombs and funeral sites, while teaching students conversational English at tourist sites. He also taught and played English word game during the nine hour bus ride to Tana Toraja. 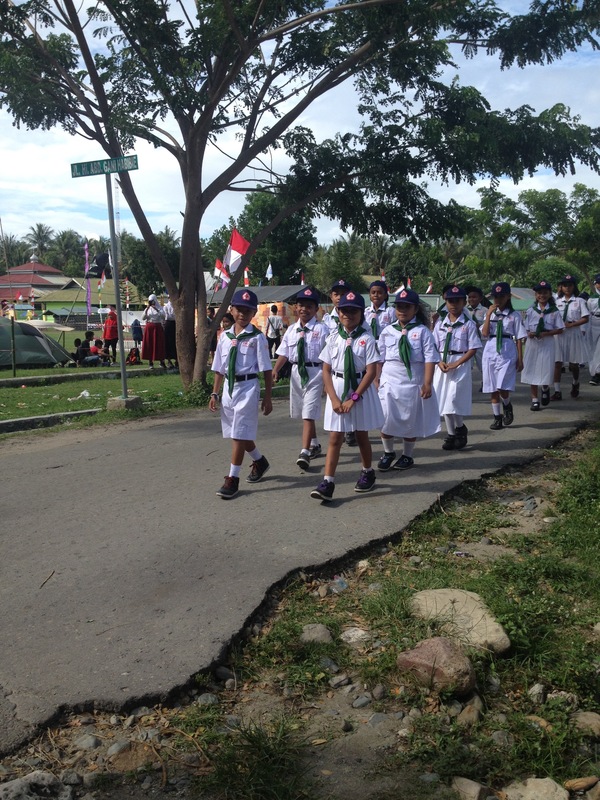 On Friday, November 6th, Kelsey Roggensack was lucky enough to be able to trek out to Boalemo, the southern part of the Gorontalo province, with her school, Insan Cendekia. They met with the mayor and visited the Bajo village, as the 11th grade students were conducting research on the Bajo people. Bajo culture is centered around the sea, and they speak a completely different language than the regional language of Gorontalo. Kelsey feels it was amazing to be a guest in their homes, watch her students conduct interviews, as well as pick up a few new vocabulary words! 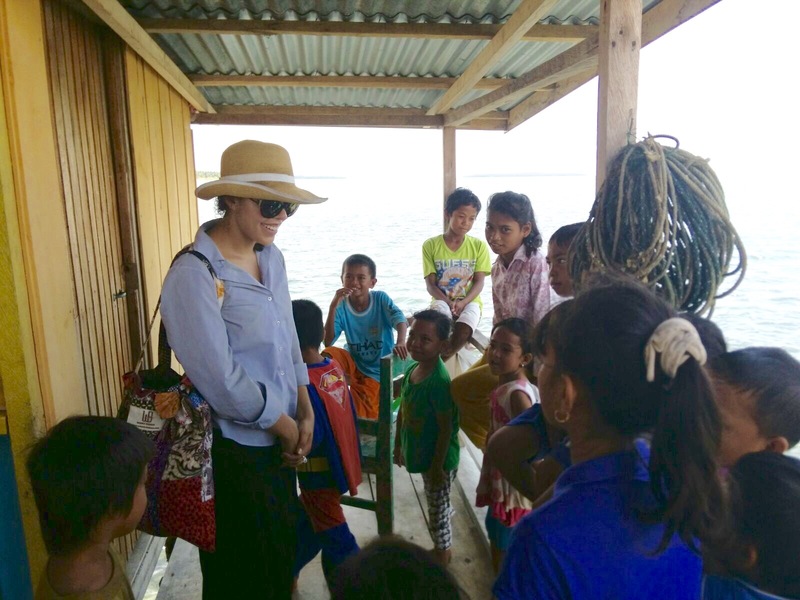 In this picture, she is talking with kids from the Bajo village. On Saturday, January 9th, Kelsey Roggensack invited students from the debate team to have dinner at her house. 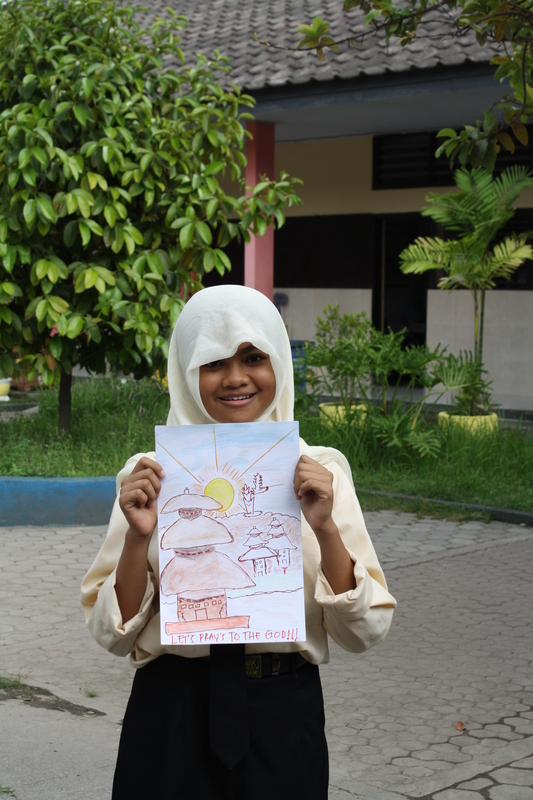 Earlier in the school year, she helped students prepare for a debate competition against students from other schools throughout Gorontalo. The debate was held at the Universitas Negeri Gorontalo, and the students won several awards at the competition. She had promised to host a celebratory feast at her house for the students and a few teachers. They finally got around to having the dinner this January and ended up eating outside on the porch because of mati lampu! 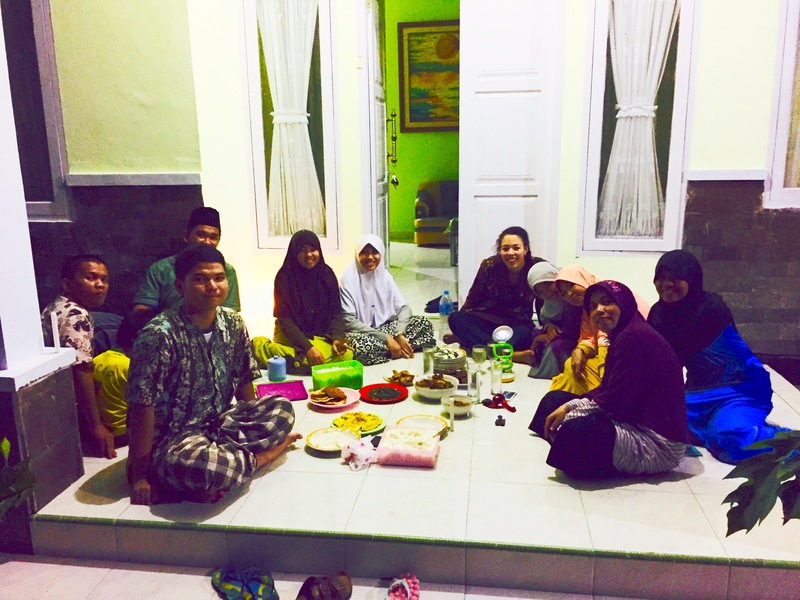 Celebrations in Gorontalo have not slowed throughout the year, and Kelsey Roggensack continues to attend her fair share. There are still many weddings to attend, and she has also been able to attend a few circumcision parties for the sons of people in the community and a few of her teachers’ sons, as well. 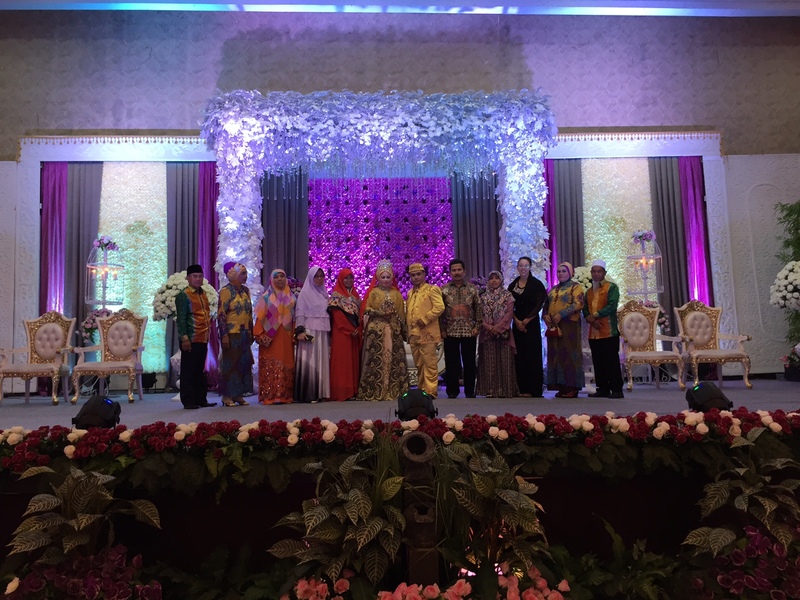 The picture below is from a wedding between two Insan Cendekia alumni with the faculty of Insan Cendekia, and she was lucky enough to join in for the school photo! Kelsey Roggensack (Gorontalo) has started holding a third English club along with her co-teachers at her school, Insan Cendekia on Monday afternoons. The other two English clubs are styled for a more formal classroom setting, so this third club is very terserah for the students. The students have chosen to focus on drama as a way to facilitate their English learning. Kelsey and her two co-teachers are working on scripts for them to act out in front of the club along with compiling plays, movies, and books, which they will read and discuss in class. The greatest highlight of Kelsey Roggensack’s year thus far has been sharing her school with her family. Her parents came to visit Gorontalo and her Ibu-Ibu, Trisna and Cica, showed them all around, and they, of course, fell in love with Gorontalo. Then, they were able to attend class with Kelsey and even help run the class! In the week they were visiting, class was focused on learning interview skills. Kelsey says it was incredible to watch her parents work with the students and share academic and career advice. Also, the students hosted a talk show complete with a Q & A of which the entire school attended. Kelsey can’t express how meaningful it was to watch the learning exchange between her family and her community at Insan Cendekia. 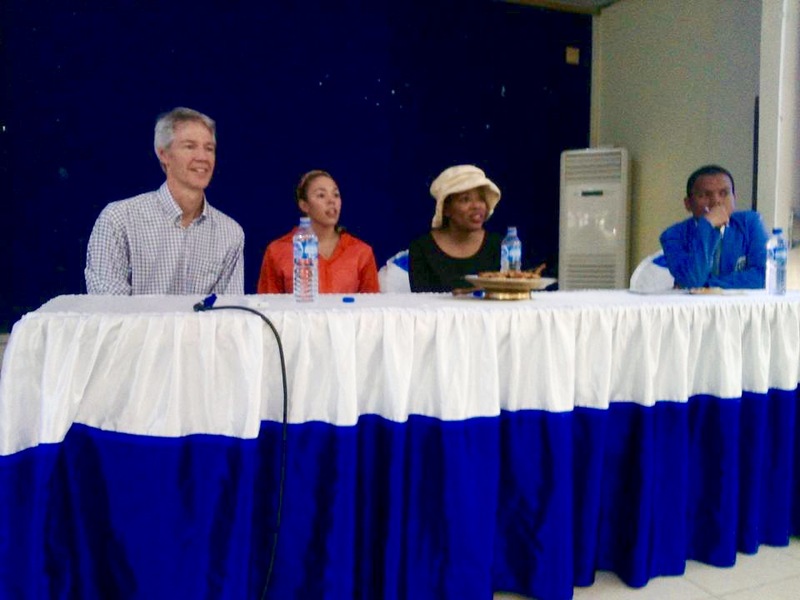 The pictures are from the talk show, of her parents and Kelsey with the female teachers after the monthly Upacara ceremony, and the Grade 10 MIA 3 students after class.